LIC Starts SMS Intimation – Things to do now. LIC of India – India’s largest public sector insurer goes digital and here are some important points to check by all policyholders in the meantime. As part of the ongoing process of digitization, LIC has decided to stop sending the premium intimation letters to its policyholders and is switching to SMS mode of intimation. The obvious reason is that LIC realizes it to be labor intensive and non-cost-effective in the current digital era. If you are an existing customer, you may already have received an SMS from LIC in the following format. Dear Customer, we inform you that LIC will send Premium Due Intimations and reminders for your Policy Number xxxxxxxx by SMS only, with effect from 01.03.2019. You have received this SMS because your phone number is properly registered in LIC policy masters. If you have received this message for all your policies, that well and good and you don’t have to do anything for the time being. 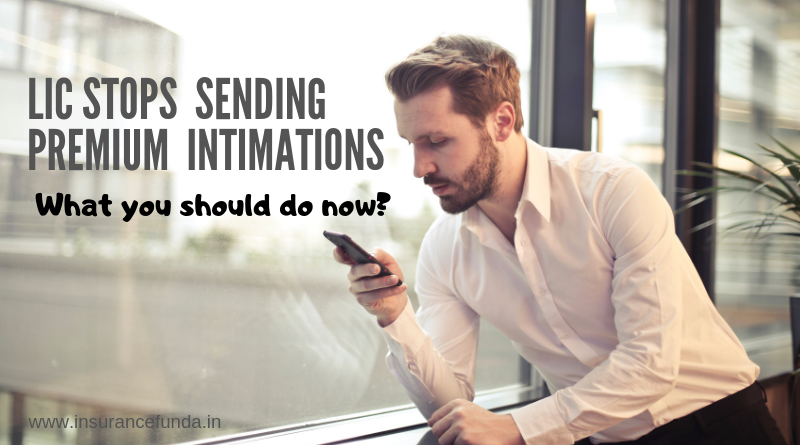 You will get prompt SMS intimations for renewing your policy. No SMS from LIC – What to do? If you have not received any SMS intimation as mentioned above for any of your policy numbers, the likely reason would be that your phone number is missing in the policy masters. In other words, you are not going to receive any premium renewal intimations for those policies until you rectify the defect. It is easy to miss your policy renewal due date, especially if you or your family members have more than one policy. The unfortunate consequence of missing a due date could be either the loss of valuable insurance coverage – when it is most needed – or unwanted burdens of reviving the policy providing health declarations and paying interest due. Read more: Special revival campaign to revive LIC policies with discounts. You can register your mobile number in the policy masters of LIC by any of these methods. Approach nearest LIC branch office and submit your phone number. Visit the LIC web site and register the phone number under ‘customer services/update contact details‘. Contact your agent to register the phone number at branch office. Updating contact details at LIC web site – How to do it? Visit LIC Web site and look for the tab ‘Customer Services’. You can easily find ‘Update contact details’ under this tab. Apart from premium due intimations, LIC will send SMS communications to intimate so many other occasions also. You may receive SMS alerts when a policy is lapsed, revived or foreclosed or a policy bond is dispatched, bonus or loyalty is added, NEFT or NACH mandate is registered or rejected, maturity amount becomes due or paid and even greeting message on New year etc. A Complete list of SMSs that will be sent by LIC can be viewed here. You can get various policy information from LIC through SMS when needed using the ‘ASK LIC’ Facility. You will have to send an SMS mentioning your policy number and key word in the format given below to 9222492224.